SICILY. Syracuse. Hieron II. 275-215 B.C. Æ litra. 9.11 gm. 20 mm. 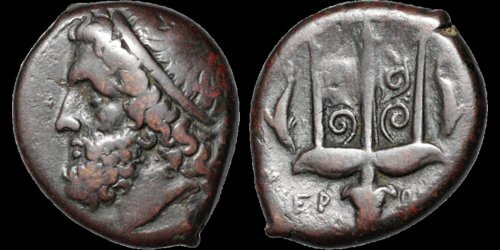 Struck 263-218 B.C. Head of Poseidon left, wearing tainia / Ornamented trident head, flanked by dolphins downward; ΙΕΡ-ΩΝΟΣ. CNS II 197. HGC 2, 1550. Near Very Fine; pleasing smooth brown patina. Scarce.